At the ISC'18 Conference in Frankfurt, Germany, Sergi Girona from the Barcelona Supercomputing Center expanded on EuroHPC, the exascale programme for Europe in the session on upcoming exascale systems. Analysing the TOP500 results, Sergi Gerona described the European Union as a union of states whereas the United States are united. Switzerland has the highest ranking supercomputer in Europe in the TOP500 list but Switzerland is not in the European Union, it is a so-called Associated Country. Therefore, in Europe there is a different mechanism to achieve objectives. Every country, every member state has its own organisation, its own objective and its own budget restrictions. This is an indication that Europe has to work together if it wants to achieve the objective of reaching exascale as well as a living HPC ecosystem not very late in the future. The top 10 machines in the TOP500 list also have European users in industry. They are clearly getting the message that they need this technology. This is already one objective that EuroHPC will be targeting to help industrial users move to exascale. In March 2017, seven countries have signed a declaration to establish the basements for EuroHPC. Meanwhile, other European Member States have joined. EuroHPC has two objectives, one representing the left pillar which is procurement and operation of the systems while the second pillar is directed towards research and innovation. In the development of research EuroHPC will be including applications, software, hardware, and processor technologies at all the levels. The infrastructure and operation is a long-term planning and it has to come to an agreement between the different Member States and the European Union. European technologies in order to incorporate in one of those systems as much technology as possible that is European and competitive, according to Sergi Girona. The objective is to finance the research programme from this direction. This will require a budget of over 500 million euro. The process now is to start the identification of the hosting sites for the exascale systems and the pre-exascale systems. This requires budgetary agreements. Half of the cost of the system is paid by each country and the other half by the European Union. There will be a tender, possibly starting late this year or early next year to decide which countries and which sites will be hosting these exascale machines. First the budget has to be clear for the next phase. This depends on the next Framework Programme by the European Commission that will only start in 2021 but that is getting approved now. Currently, one is already working with users in quite large groups, according to Sergi Girona, to define the user requirements. The user groups will help on the development and the co-design of the exascale systems. There is implementation timing needed for the procurement of the two pre-exascale and two petascale systems with a planned operational start in 2021. This means that the procurement has to start no later than in 2019. Sergi Girona stated that one has enough time to work on the technical documentation and agreeing on the possibilities. 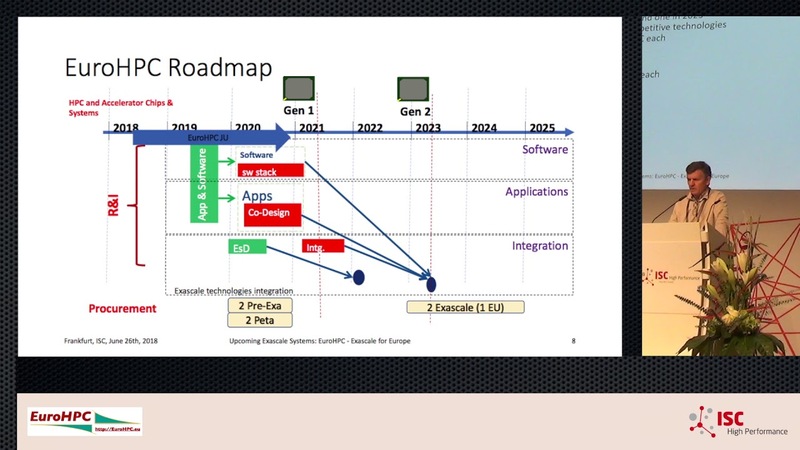 The two exascale systems are planned for 2022/2023. There is also the different timing of the research problems. First, there is the creation and delivery of the European processor. The European Processor Initiative (EPI) is financed by the European Commission and the Member States with 100 million euro. The EPI project partners are planning to develop different generations of processors in different stages. It is not possible, of course, to implement these in the pre-exascale systems because they will not integrate the new technology but one is looking forward to implement them in the future. EuroHPC Joint Undertaking is the codename for a private company at the European level. It will start operating early 2019. It will stay in operation for the duration of the programme. This entity will be running the procurements and will be financing the research. There will be financing for software, application, co-design and possibly integration of these technologies in the so-called extreme scale demonstrators that will enable to start trying out the different technologies that have been funded in the European Commission for a number of four to six years. So, there will be some demonstrators to find out if these technologies prepare for the exascale systems to come. The European Parliament has given the signal to develop the European HPC strategy. With this next step, the EuroHPC Joint Undertaking will be established and start operations. It will start implementing in the next years the procurement of the new systems and make sure that the research that is being developed in Europe is on track to be successful by 2022/2023 to have exascale systems ready, Sergi Girona concluded.